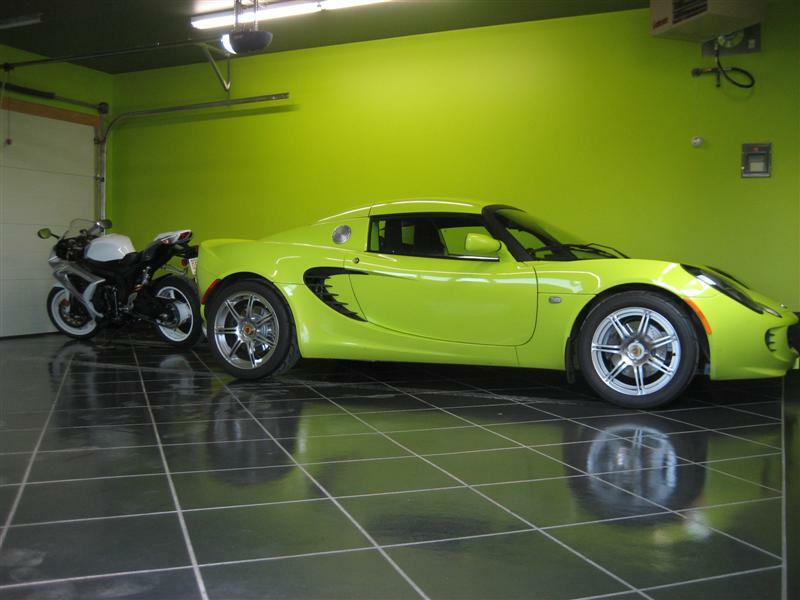 I dropped the Lotus off at the Houston Aston Martin dealer the other day for service and my wife liked their tile floor. Now she wants tile in her garage, we only keep 2 cars in there Audi S5 and the Elise so, weight isn't a factor. Has anyone any experience with ceramic tile on garage floors? I've been planning on doing my separate garage as soon as finds allow. Go over to www.garagejournal.com for a forum dedicated solely to garages. They have an entire sub-forum dedicated just to flooring options. I go back an forth between real time or something like RaceDeck. Both have their pros and cons. Real tile can be more expensive if you have someone else do it, and if money isn't really a factor then I personally would go that route. The RaceDeck seems easier to do yourself and you can have a little more fun with the patterns perhaps. But if I were you I'd capitalize on you're wife wanting the floor done ASAP! Forgot to say that if you do go with RaceDeck you can call them and say you're on the garagejournal.com forum for a special discount. Let us know what you end up choosing to do. I'm always looking for more ideas on this. What a waste of money. That being said, my brother did this with the black and white design. Again, what a waste of money. It's a garage for pete sake. Pretty much everything is a waste of money to someone else. I also have a little watch collection, nothing too crazy (IWC's, an Omega, Tag Heuer, and Tudor). Now that's a hobby that's a waste of money! But is it a waste of time? Tile has grout. Grout deteriorates, absorbs stuff, every time. I'm sure there are plenty of great tile garage floors but I can't see it. Love our professionally done epoxy loaded with tons of plastic specs. Super durable, good traction, looks fine. Like fitfan said, make sure that there are no voids in the set or the tiles will crack when there is load on it. You can check to see if it was set well by tapping it with something solid. It will sound hollow if there is a void. you can use an epoxy grout and very tight spacing. people do that all the time. fitfan, your floor looks fantastic! Doge and fitfan - both beautiful garages! 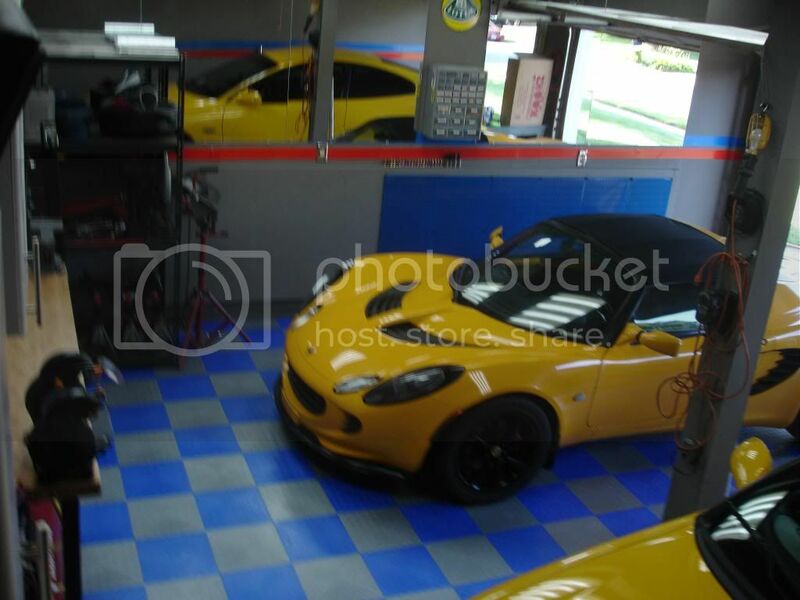 I wish that was my garage. Well, I wish that was my floor. I love my garage, just need to have the floor done. Porcelain Tile... PEI 5... charcoal non-sanded grout with charcoal colored sealant. It's beautiful, durable, easy to clean. Been installed ~9 months with no cracks and chips, even with my full size Dodge Ram parked on it. I figured the cost to install was $2.25 / sq ft and DYI. I did 1/2 the floor at a time so the Loti was always indoors... kinda see that in the first pic only 1/2 was completed when I snapped the pic. Its a great winter project!